DH has always been a meat and potatoes man and for that matter I like them too. So we have always had some sort of potato in the house for as long as we have been married which is going on 35 years. When our daughter J. was studying bats in school around 1997. At that time, I remembered from my child hood that my grandfather would wrap a rock in a white cloth, securing it with a string and then he would throw it up in the air at dusk. Bats would be attracted to the white and fly towards it. He also lived on 2.5 acres of land in a rural area of Bucks County, PA. We however, lived in a community with less than a quarter acre lots, I really didn’t want to throw a rock up in the air thinking that when it came down, it might hit our car or worse. So, that day we had baked potatoes for dinner and I cooked an extra one, which we put into one of DH’s white socks securing it with a rubber band. At dusk, the girls and I went out side and tossed the sock up in the air. When it came down it didn’t hurt anything. We didn’t attract any bats, but we kept trying anyway. So the final time, I tossed the potato up, it got stuck up in a 20′ high tree. That was the end of us trying to attract bats. About 10 years later, DH was outside and he saw one of his socks on the ground. So when he picked it up, he brought it in and showed me the weird thing in it, which he had no idea what it was. I started laughing out loud, as it was a tiny petrified potato. Nowadays, we don’t play with our food… well maybe, just a little. Use the butter to grease a square pan with sides. Quarter the potatoes, leaving skins on. Mix onions, potatoes and olive oil together. Season with salt and thyme mixing well. Place onion potato mixture into pan. Roast potato mixture for 30 minutes. Remove from oven and scrape the potato mixture off the pan, and turn them over. Place back in oven and roast for an additional 30 minutes or until tender. Sprinkle cheese on top and roast for an additional 15 minutes. I made these the other day and they were delicious! 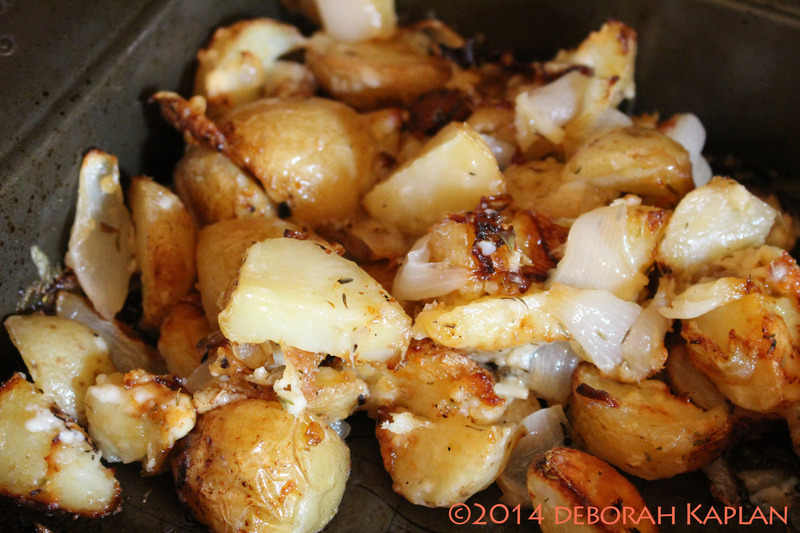 I didn’t have Yukon potatoes so I substituted with russets cut into quarters and had no problem. The timing was perfect so we had tender, but not over cooked potatoes. Will definitely make them again soon! Thank you for the great review! I’m glad everything worked out for you!